Along with revised GDP numbers, we now have GDP per head for 2014 as a whole. (I have used estimates for the fourth quarter up until now.) Growth in 2014 was 2.17%. That is certainly an improvement on previous years: 2013 1.03%, 2012 -0.01%, 2011 0.80%, 2010 1.10%. However it is no more than the average growth rate between 1955 and 2010 of 2.1%. As charts that I have posted earlier clearly show, this average of around 2.1% really does reflect what looks like a pretty constant trend over the past. We have had recessions before, but they were followed by above average growth: in 1983 GDP per head grew by 4.2%, and in 1994 by 3.8%. So as recoveries go, this one has been terrible. There are signs that the Eurozone recovery may also be beginning. If this turns out to be the case, you are sure to read a great deal about how this is all down to the ECB finally adopting Quantitative Easing. I suspect you will read rather less about another explanation, which is that fiscal contraction began to ease off last year, and that this will continue into 2015. The chart below is from the March 2015 OECD Economic Outlook, so the 2014 numbers should be fairly reliable estimates. The message in both cases is simple. Fiscal austerity reduces growth. When fiscal austerity stops, growth can resume. It’s a message that rather a lot of people who were responsible for the fiscal tightening would rather you didn’t hear. Whenever I write a post critical of German views on Eurozone policy, I get comments which can be paraphrased in the following way. Greece (and maybe other Eurozone countries) are incapable of governing themselves properly, and when they get into difficulties Germany has to bail them out, so it is only reasonable that as a price for this Germany should insist on imposing changes to the way these countries do things. To say such an attitude is inherently wrong (wrong in any possible circumstances) seems to be too strong. The IMF, after all, has played a very similar role many times. Many may criticise the kinds of reforms that the IMF has demanded as part of its conditionality, but to suggest that conditions are never made as part of such a loan package seems unrealistic. But while conditionality of any kind cannot be ruled out, it can also go far too far. It should never become imperialism, and the choices of a sovereign people should be respected and accommodated, not ignored. 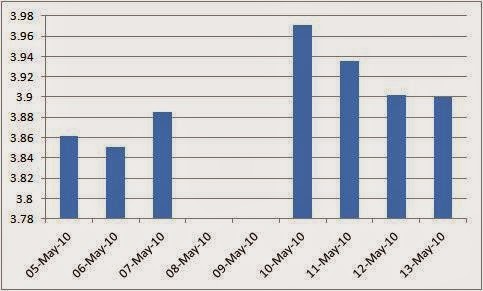 It is clear that the Greek government ran up unsustainable debts, and tried to hide these. As a result, it was bound to default on those debts. As doing so would exclude it from the markets for a time, it was also reasonable to lend (not give) Greece money to enable it to gradually rather than immediately achieve primary balance. Some conditionality to correct any underlying weaknesses in the openness and accountability of the budgetary process would seem reasonable in such circumstances. Contrast that with what actually happened. First the Eurozone resisted default, and then it was only partial, which meant providing far larger official loans than were needed. The beneficiaries of this were mainly the financial institutions (e.g. Eurozone banks) who would have otherwise lost money. Second, ridiculously severe austerity was imposed, which crashed the economy and made it much more difficult for Greece to adjust. Third, conditionality far in excess of what was required is being imposed. All this reminds me strongly of how certain attitudes to beneficiaries of the welfare state have been encouraged by the UK coalition government. Rather than admit that unemployment benefits had risen because of the recession and the absence of a recovery (itself a result of austerity), the focus became on the personal failings of the unemployed themselves. The media (TV as well as the tabloids) are still full of examples of supposed ‘welfare cheats’, but they rarely put such examples into context: how tax evasion is a bigger problem that benefit fraud, for example. People do hate the idea of ‘their taxes’ allowing ‘other people’ to get ‘something for nothing’. In contrast tax evasion does not sound too different from tax avoidance, which many people do as much of as they can. Condemning one and ignoring the other may be human nature. What is clearly wrong is politicians playing on these feelings to misdirect anger away from their own mistakes, or undertaking unnecessary or even harmful policies to play to the gallery. A clear case of the latter is the recent increase in benefit sanctions, which are being applied in an excessive and unfair way, greatly increasing the use of foodbanks as a result. That a committee of MPs where the government is in a majority have expressed grave concerns about the policy just before an election gives an indication of the scale of the injustice that has been taking place. When politicians do this, it is a sign of chronic political weakness: a desperate attempt to cover up past mistakes. There is a strong danger that the same dynamic may occur in the continuing standoff between Greece and the Eurozone. Having encouraged a rhetoric where a virtuous Eurozone has shown nothing but generosity to a feckless Greece, politicians feel compelled to live up to that false narrative by acting tough in negotiations, which does no one any good to put it mildly. When Putin behaves recklessly to boost his popularity and succeeds, we can blame the lack of press freedom. When political leaders in the UK or Germany play the same trick, do we blame the media for playing along or the people for falling for it? One of Paul Krugman’s first books, Peddling Prosperity, made a distinction between academic economists and people he called "policy entrepreneurs". These are individuals who promote particular intellectual positions and ideological policy prescriptions which have little or no academic support, but which may appeal to certain politicians. I remember it as a great book, and unfortunately one of the main subjects - the idea that tax cuts pay for themselves - is still current in the US. It remains the case that this idea has virtually zero academic support, but for whatever reason - the activities of policy entrepreneurs being one - it still has a tight hold on the Republican Party. I also remember being dissatisfied with the concept of the policy entrepreneur. It seemed to me that the book failed to situate them in a more general framework of how different interests influenced policy. Why were policy entrepreneurs particularly prevalent in economics? Could academics also be policy entrepreneurs? But that was the social scientist in me speaking. It was clear that such people existed, and that their influence could be far from benign. I was reminded of all this when someone referred me to Andrew Sentance’s latest piece where he advocates moving to a zero inflation target. Coupled with George Osborne and David Cameron proclaiming zero inflation as a great success, a horrible thought occurred. If these guys were re-elected, might they find the arguments of Andrew Sentance appealing, and actually go for zero inflation? (In the UK, the Chancellor sets the inflation target.) Getting rid of inflation completely - sounds like a vote winner! Why is it a horrible thought? Because all the academic discussion has been going in the opposite direction, for a very good reason. The Great Recession has highlighted the problems caused by the lower bound for nominal interest rates. That problem will not go away if that lower bound turns out to be -1% rather than zero. The discussion of secular stagnation has highlighted how the ‘underlying’ level of real interest rates has steadily fallen over the last few decades. Put the two together, and you see that a 2% inflation target may mean that we hit the interest rate lower bound far too frequently for comfort. A higher inflation target is one way, although not the only way, of reducing this problem. Given this, calling for a zero inflation target seems perverse. In response, Andrew Sentance says this: “And the fact that a target of zero inflation may not allow central banks to easily impose negative real interest rates may actually be a good thing – protecting savers, who have suffered heavily as a result of very low interest rates since the financial crisis.” This is just the kind of thing a policy entrepreneur would say: identify your target interest group, and appeal to their interests over the common good. A politician who wants to appeal to savers might think that sounds like a good idea, and before you know it the policy is in place. I suspect things have moved on a little since Peddling Prosperity was published. The role of think tanks is probably greater. The good ones are a means of channelling academic research, as in this very recent discussion of how to enhance real wage growth from the Resolution Foundation (which I would call excellent if it didn’t have a contribution from me). But they are matched by others that are effectively the institutional equivalent of policy entrepreneurs. One answer to this problem is delegation. If you delegate an issue to a non-political body, that institution is going to be less swayed by the policy entrepreneur, and more influenced by knowledge and evidence. The independent central bank is an obvious example. It is interesting that one of the contributions to the Resolution Foundation volume, from John Van Reenen, calls for a “permanent infrastructure strategy board”, to improve the level and quality of national infrastructure. Of course with delegation comes the danger of power without accountability, and one particular central bank is a good example of that. Is delegation the only way we have of protecting ourselves from the policy entrepreneur? I have one final thought. (The idea comes from Chris Dillow, but he said it on my blog first!). Policy entrepreneurs exist in part because of sectional interests. The problem arises if sectional interests drown out evidence based policy. Society as a whole clearly has an interest in evidence based policy, but one institution that is well placed to protect society’s interest here is academia. Although - in the UK at least - academia encourages the dissemination of research, most academics are always going to value their research above its dissemination, because that is how internal incentives work. So maybe the academic sector needs to create a few policy entrepreneurs of its own, whose mission is to disseminate not their own research, but research in a whole field. One of two examples already exist - maybe we should have more of them. Chris Giles says today that “there is a gap [between Labour and Conservatives plans] of more than £30bn a year in public spending by the end of the decade, at least 1.4 per cent of national income. This is a bigger political divide seen in any election since the days of Margaret Thatcher.” Chris is absolutely right to focus on this fact, and it is really important that other journalists (including those on the political side) do the same. The reason is that neither Labour nor the Conservatives want to admit this. Labour wants to appear as if they are being ‘tough on the deficit’ and the Conservatives want to turn this into a ‘Labour would put up taxes’ election. With all the noise that these phoney debates throw up, it is important that someone tells people what the consequences of their vote will be. The term rollercoaster was coined by Robert Chote, head of the Office for Budget Responsibility. But if the rollercoaster will never happen, was Robert wrong to use this word? Absolutely not - in using that term he was doing his job in a very effective way. As Chris explains, the reason why the numbers given to the OBR generate a rollercoaster profile is the revised fiscal rule, which says that there should be (cyclically adjusted) balance within three years. Like the old rule, this is a rolling target (but now for three years ahead rather than five), so it means in effect that governments can keep putting off the date balance is achieved as each year rolls past. If governments start planning their fiscal actions with this in mind, the rule becomes largely worthless: it means reducing deficits mañana. As I explained here, rolling targets are a good idea because they allow policy to be flexible in the face of shocks. But rolling targets can also be abused by an irresponsible government to forever put off deficit reduction. As I argued here, there was no good reason for Osborne to switch from a five to three year rolling target, and good reasons to stick to five years. The move to three years looked like a political ploy to embarrass the opposition. When politicians start messing around with fiscal rules for political ends, and these rules then produce silly results which politicians have no intention of sticking to, it is important that an independent institution with the words ‘budget responsibility’ in their title calls attention to what is going on. Robert Chote did that very effectively by using the term rollercoaster. Where I think Chris is wrong is in describing plans to decrease debt slowly as risky. The opposite is the case. With interest rates near their floor, sharp austerity puts the economy at risk from adverse macroeconomic shocks. And more on whether price setting is microfounded in RBC models. For macroeconomists. What is a NK model? It is a RBC model plus a microfounded model of price setting, and a nominal interest rate set by the central bank. Every NK model has its inner RBC model. You could reasonably say that these NK models were designed to help tell the central bank what interest rate to set. In the simplest case, this involves setting a nominal rate that achieves, or moves towards, the level of real interest rates that is assumed to occur in the inner RBC model: the natural real rate. These models do not tell us how and why the central bank can set the nominal short rate, and those are interesting questions which occasionally might be important. As Stephen points out, NK models tell us very little about money. Most of the time, however, I think interest rate setters can get by without worrying about these how and why questions. Why not just use the restricted RBC version of the NK model? Because the central bank sets a nominal rate, so it needs an estimate of what expected inflation is. It could get that from surveys, but it also wants to know how expected inflation will change if it changes its nominal rate. I think a central banker might also add that they are supposed to be achieving an inflation target, so having a model that examines the response of inflation to the rest of the economy and nominal interest rate changes seems like an important thing to do. The reason why I expect people like David Levine to at least acknowledge the question I have just answered is also simple. David Levine claimed that Keynesian economics is nonsense, and had been shown to be nonsense since the New Classical revolution. With views like that, I would at least expect some acknowledgement that central banks appear to think differently. For him, like Stephen, that must be a puzzle. He may not be able to answer that puzzle, but it is good practice to note the puzzles that your worldview throws up. Stephen also seems to miss my point about the lack of any microfounded model of price setting in the RBC model. The key variable is the real interest rate, and as he points out the difference between perfect competition and monopolistic competition is not critical here. In a monetary economy the real interest rate is set by both price setters in the goods market and the central bank. The RBC model contains neither. To say that the RBC model assumes that agents set the appropriate market clearing prices describes an outcome, but not the mechanism by which it is achieved. That may be fine - a perfectly acceptable simplification - if when we do think how price setters and the central bank interact, that is the outcome we generally converge towards. NK models suggest that most of the time that is true. This in turn means that the microfoundations of price setting in RBC models applied to a monetary economy rest on NK foundations. The RBC model assumes the real interest rate clears the goods market, and the NK model shows us why in a monetary economy that can happen (and occasionally why it does not). Today it was announced that UK consumer price inflation hit zero in February. 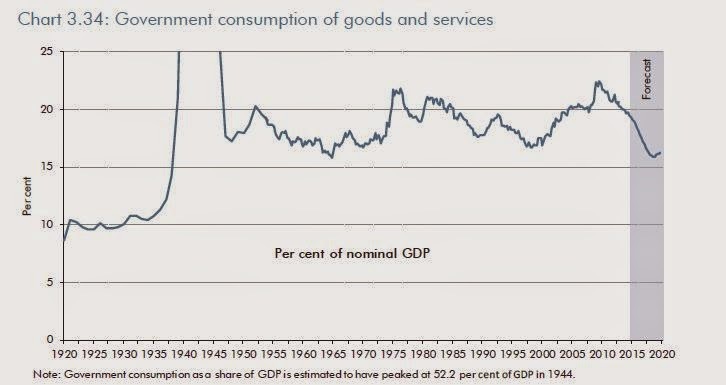 The ONS estimate that we have to go back to the 1960s for the last time this happened. More importantly, core inflation fell back 0.2% to 1.2%, after 0.1% increases in the previous two months. As Geoff Tily points out, if you take out the 0.2% contribution from the decision to raise student fees (which are hardly an indicator of excess demand), then the Governor could be writing a letter to the Chancellor based on core inflation, and not just the actual inflation rate. The Chancellor is in election mode and so does not care: in fact he says zero inflation is good news, and he just hopes no one asks him why he chose to reaffirm a symmetrical 2% target. For the Bank of England it means the key question is now should they cut rates? As I noted here, optimal control exercises on the Bank’s model and forecast say they should, and I discussed here why there is an additional strong prudential case for doing so. The point I want to make now is about survey evidence on capacity utilisation. I had a number of memorable meetings with various economists and officials at the Treasury, Bank and elsewhere when the Great Recession was at its height, but the one that left me most puzzled was with one of the more academic economists at the Bank of England. It was at about the time that core inflation started rising to above 2%, despite unemployment being very high and very little signs of a recovery. At much the same time survey measures of capacity utilisation were suggesting a strong recovery, completely at variance with the actual output data. The gist of our discussion was: what the hell is going on!? It was particularly puzzling for me, because I had many years before done a lot of work with survey data of this kind, and back then it seemed pretty reliable. The problem with the 2010 period was that it was exceptional, and so in that sense it was not that surprising to see surprising things going on. My own pet theory at the time was that the financial crisis had made firms much more risk averse, which made them less likely to cut prices in an attempt to gain market share. Move on to today, and things are perhaps a bit less exceptional. What today’s figures emphasise is that the inflation ‘puzzle’ of 2010/11 has gone away. Levels of inflation are now much more consistent with substantial spare capacity in the economy. However the bizarre behaviour of the survey data has not disappeared. 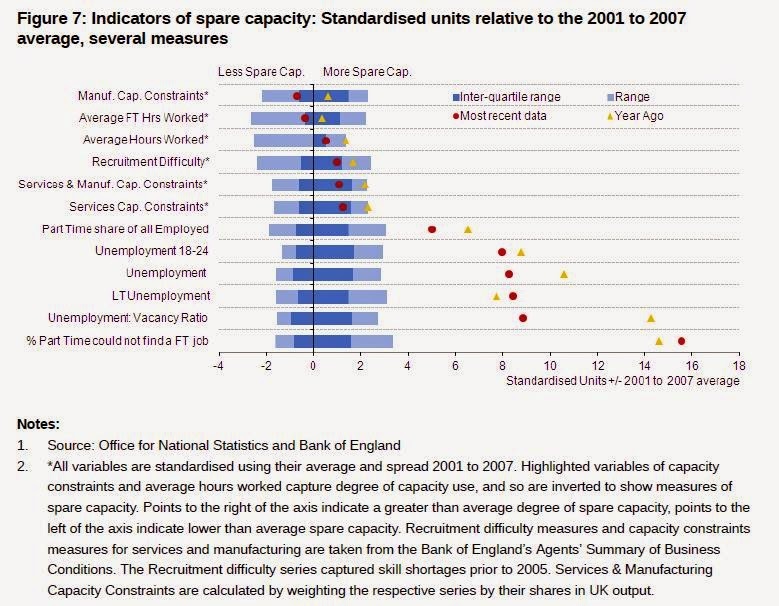 Here is a nice chart from the ONS, comparing various different measures of spare capacity. What it shows is that labour market indicators suggest an amount of spare capacity well outside the ‘normal’ range from the pre-recession years. In contrast, both hours worked and survey based indicators (the first six measures) suggest the output gap is quite small, and in one case actually positive. As this OBR paper shows, survey measures of capacity utilisation were suggesting a positive output gap as early as 2012. Faced with this combination of spare capacity in the labour market and firms reporting its absence, a macroeconomist would suggest it could be a consequence of high real wages, encouraging substitution from labour to capital. Firms were fully utilising their capital – hence no spare capacity – but had hired less labour as a result. However a notable characteristic of this recession in the UK has been the high degree of labour market flexibility, with large falls in real wages. One of the more persuasive theories for the UK productivity puzzle, which I outlined here, is that we have seen factor substitution going in the other direction. Back in 2010, I was reluctant to suggest the survey data were simply wrong, partly because of their past reliability but mainly because inflation was telling a similar story. On the day that inflation hits zero, I think the argument that these survey measures are not measuring what we used to think they measured has become much stronger. But that still leaves an unanswered question - why have they gone wrong, when they worked well in the past? In other words if only those lazy Greeks had taken the difficult decisions that the UK took, they too could be like the UK today. This is such as travesty of the truth, as well as a huge insult to the Greek people, that it is difficult to know where to begin. Let’s start with the simple statement of fact. According to OECD data, the 2010 government deficit in Greece was 11%, and in the UK 9.5%. The Prime Minister is normally well briefed enough not to tell outright lies. But look at this chart you can see why the statement ‘virtually in the same boat’ is complete nonsense. The real travesty however is in the implication that somehow Greece failed to take the ‘difficult decisions’ that the UK took. ‘Difficult decisions’ is code for austerity. A good measure of austerity is the underlying primary balance. According to the OECD, the UK underlying primary balance was -7% in 2009, and it fell to -3.5% in 2014: a fiscal contraction worth 3.5% of GDP. In Greece it was -12.1% in 2009, and was turned into a surplus of 7.6% by 2014: a fiscal contraction worth 19.7% of GDP! 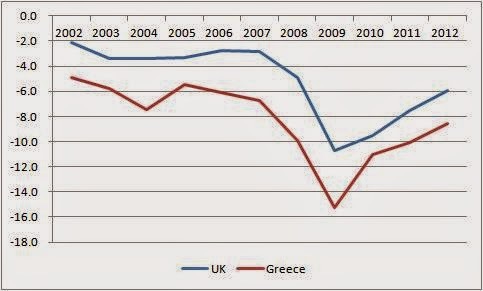 So Greece had far more austerity, which is of course why Greek GDP has fallen by 25% over the same period. A far more accurate statement would be that the UK started taking the same ‘difficult decisions’ as Greece took, albeit in a much milder form, but realised the folly of this and stopped. Greece did not get that choice. And I have not even mentioned the small matter of being in or out of a currency union. From the Prime Minister, let’s move to Janan Ganesh, FT columnist and Osborne biographer. He says that Osborne’s secret weapon is his “monstrously incompetent adversaries”. If only the Labour party had “owned up to its profligacy in office during the previous decade” it would have more authority in the macroeconomic debate today. I have written a great deal on this, but actually you can get the key points from the chart above. If you have a target for government debt which is 40% of annual GDP, and nominal annual growth is around 4%, you want to aim for a deficit of 1.6% of GDP. Labour clearly exceeded that, which is why the debt to GDP ratio drifted up from 30% of GDP in FY 2000 to 37% in FY 2007 (OBR figures). A mistake? Yes, particularly in hindsight. Profligacy - absolute nonsense. The debt to GDP ratio in FY 2007 was below the level Labour inherited, which does not sound like a profligate government to me. Nor does a deficit in 2007 that is only about 1% above a long run sustainable level signal profligacy. What blew the deficit was the recession. Ganesh acknowledges that, but says “there was no excuse at all for pretending that a recession was never going to happen “. This is pure hindsight stuff. In 2007, the consensus was that the UK was close to balance in terms of the output gap. It is only subsequently that some have tried to suggest, rather unconvincingly, that 2007 was really a global boom. So Labour was not pretending anything. But why this urge for Labour to apologise for what is a relatively minor misdemeanour which had no major consequences. Because it plays to the Conservative narrative: their version of history where Labour was responsible for the mess that the Conservatives had to clean up. Labour has been forced by mediamacro to buy into the deficit reduction narrative enough as it is: asking for more is just self-serving political nonsense. As for the phrase ‘monstrously incompetent’, I really wonder what world Ganesh lives in. When I look back at Chancellors of the past, I see few candidates for this label, and Brown and Darling are not among them. However what term would you use for a Chancellor that freely chose a policy of premature austerity, and as a result lost every UK adult and child resources worth at least £1,500? That unforced error does sound like something worth owning up to. The worst that can be said is that, had Labour kept debt at 30% of GDP, they might have felt less constrained in 2009 and undertaken greater countercyclical fiscal action. But George Osborne argued against the countercyclical fiscal actions Labour did take in 2009! That is of course an unsubstantiated conjecture, and the following is not meant to be evidence, because its a small and unrepresentative sample. In a previous post I mentioned a debate that Prospect magazine organised between myself and Oliver Kamm. I hadn’t realised until someone pointed it out (along with a rather biased editorial in that same issue), but readers get a chance to vote after reading this debate on whether ‘austerity is right for Britain’. At time of writing, we had 17% voting Yes and 83% voting No. At the beginning of last year, there were many who were predicting a rise in UK interest rates in 2014. By then UK unemployment had been falling for many months, and we had had four quarters of solid growth. However I said that if rates did rise in 2014 it would be extraordinary. One of the reasons I gave was that there was absolutely no sign of any increase in nominal wage inflation. I thought it would be particularly odd if UK rates rose before US rates, given that the UK’s recovery was lagging a few years. Unemployment continued to fall rapidly. By June 2014 even the Bank’s governor, Mark Carney, was giving indications that rates might rise sooner than some were expecting. US monetary policymakers showed no signs that they were about to raise rates, and I still thought they should be the first to move, but I was worried that the MPC was sounding too itchy. Sure enough in August two MPC members voted to raise rates. But wage inflation showed no signs of increasing. Move forward to March 2015, and the prospect of rate increases seem to be receding on both sides of the Atlantic. On Wednesday the FOMC revised down their forecasts for inflation, and also revised down their estimate for the natural rate of unemployment. The reason is straightforward: despite continuing falls in unemployment, wage inflation refuses to budge. John Komlos argues that this state of affairs is unlikely to change anytime soon. Much the same seems to be true in the UK, as this excellent account from Andy Haldane makes clear. In the UK there is an additional twist. To quote Haldane: “Back in 2009, the MPC’s judgement was that the benefits of cutting rates below 0.5% were probably outweighed by their costs, in terms of the negative impact on financial sector resilience and lending. With the financial sector now stronger, the MPC judges there may be greater scope to cut rates below 0.5%.” It now looks like the Zero Lower Bound (ZLB) may actually be zero. Haldane goes through in great detail the possible reasons why wage inflation seems so sticky. Moving to the monetary policy implications, he talks about asymmetries, and many of the issues that I raised here he also raises. However he ends with something that I think is even more telling. The chart below shows an optimal interest rate path, using the Bank’s COMPASS model, and assuming a ZLB of zero. What it does is confirm a suspicion that both Tony Yates and I had about the MPC’s current stance. 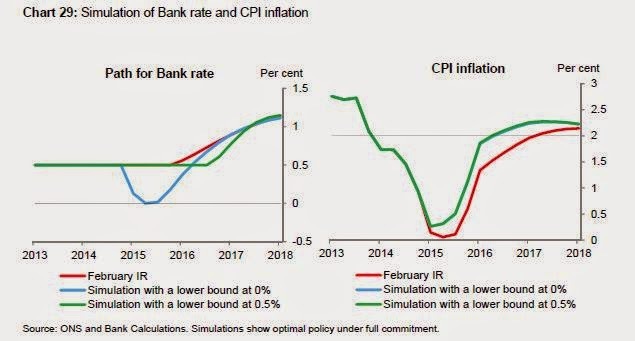 The policy of doing nothing, and waiting for the inflation rate to gradually converge towards 2%, does not look optimal even if the Bank’s forecast is completely correct. The prize for the biggest piece of pure fantasy yesterday must go to the Chancellor when he said this: “Today, our goal is for Britain to become the most prosperous of any major economy in the world in the coming generation, with that prosperity widely shared across our country.” In terms of a key measure of our long term prosperity - output per hour worked - we were indeed catching up with the US, France and Germany until 2008, but since then we have lost ground as productivity growth has stagnated. But the fantasy that was most on display yesterday in commentary about the budget was the idea that the budget deficit was or is our major problem. I watched Robert Peston go into great detail about just how large the budget deficit still was (how much we were borrowing every minute - that kind of thing). I saw Financial Times editor Tony Barber describe what a hole the UK was in when the Coalition came to power, because the deficit was 11% of GDP. The implication in both cases is that these numbers are so large we have to immediately focus on bringing them down. The hole I remember from 2010 and before was the Great Recession, which in turn was caused by a financial crisis. They really were major events, which had major impacts on people, and which therefore demanded an immediate policy response. The deficit exceeding 10% of GDP had no real impact whatsoever. Interest rates on government debt stayed well below the level of the previous ten years, and over time fell further. 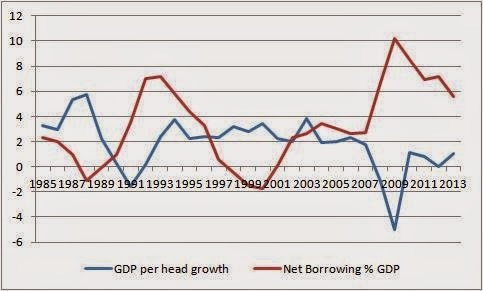 Here is the growth in GDP per head and the public sector net borrowing to GDP ratio going back to 1985. In the early 1990s we had a small recession as we tried to stay in the European Exchange Rate Mechanism at an overvalued exchange rate. Public borrowing rose to 7% of GDP for two years. But the economy recovered rapidly following the 1992 depreciation and associated monetary policy easing, and the deficit came back down. In 2008/9 we had a much larger recession, and as a consequence the deficit ratio rose rather more. But the key point was that this rise in the deficit in both periods was largely a response to the decline in GDP, which helped moderate the recession, and not an immediate problem in itself. So the idea that in 2010 we were in a deep hole because of the deficit is just fantasy macroeconomics. It replaces something real (a financial crisis and deep recession) with something of little immediate consequence. The problem with living in a fantasy world but taking actions in the real world is that you make big mistakes, like starting fiscal austerity while still in a liquidity trap, which has made each UK adult and child on average at least £1,500 poorer. For mediamacro, which inhabits the same fantasy world, it means you ignore the important issues. So we had everyone getting excited about the completely meaningless fact that the Chancellor had pencilled in an expansion in spending in 2019 and 2020. (Thank goodness for the OBR, whose use of the word 'rollercoaster' helped expose this circus.) As a result, comment largely ignored the problem of productivity stagnation, the absence of any expected growth in net trade, and more generally the persistence of macroeconomic imbalances that on earlier occasions the Chancellor had said it was vital to correct. Martin Wolf, who thankfully is very much part of the real world, said the Chancellor had “made the best of what is, in truth, not that strong a hand”. I think Martin is being too generous. 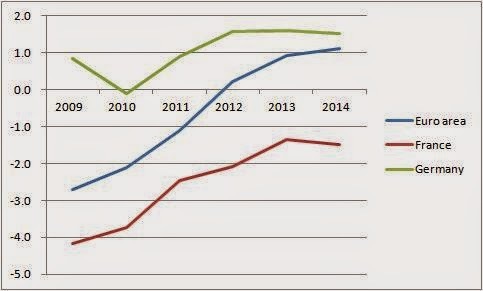 The Chancellor asked us to enter a fantasy world, where the fact that living standards just might end up higher than when he came into office is regarded as a success, where employment growth that matches or exceeds output growth is regarded as a triumph, where finally achieving what are no more than average growth rates in GDP per capita during what should be a recovery phase is praised, and where reducing the deficit is all important. It is a shame that too many others seem happy to share this fantasy. In financial year 2009 the PSNB was actually 10.2% of GDP. Chris Giles, Sarah O’Connor and Vanessa Houlder at the FT have a nice graphical summary of key variables that backs this up. What exactly was George Osborne trying to achieve in his budget? Janan Ganesh says “To his gut, he worries about debt.” But if reducing the deficit and debt really was his number one priority, then why spend £5.7 billion over five years increasing the income tax personal allowance, give £3 billion away to savers, and add a £2.2 billion subsidy for first time house buyers? It is true that these giveaways were matched, in theory, by various ‘takeaways’ (mainly a £4.4 billion increase in the bank levy), but if getting the deficit down was the priority, he could have done the takeaways without the giveaways. Everyone knows the answer of course. Winning the next election is much nearer Osborne’s gut than worries about debt. Much has been made of Labour’s alleged core vote strategy, but what this and earlier budgets suggest is that the Conservatives have been following a core vote strategy. There are income tax cuts that mainly benefit the well off, bribes or tax breaks for the elderly with large savings or pensions, and measures to help those expecting to buy a house (and consequently those planning to sell them their house). Why do commentators complain about a core vote strategy for Labour but not the Conservatives? I’ll leave that as an exercise for the reader. The Chancellor could not give away more because he needed to maintain the image of prudence. The sharp cuts in spending after the election remain: to quote the OBR: “a much sharper squeeze on real spending in 2016-17 and 2017-18 than anything seen over the past five years”. With the OBR predicting interest rates will be very close to their lower bound over that period, this still amounts to taking a big risk with the economy. He was unlucky the last time he tried this in 2010 (and we are on average at least £1,500 poorer as a result), so I guess he hopes he will get lucky this time. Is this all because of worries about debt, at a time when interest rates on debt are very low, and the chances of a debt funding crisis are non-existent? Even the Economist now suggests that maybe the terrible performance of UK productivity over the last five years might be a rather more important issue to focus on. Anna Valero and Isabelle Roland have a nice LSE briefing paper on this, from which this figure is taken. The good news is that UK productivity growth has been relatively strong from 1979 to 2008, perhaps partly because we had some catching up to do. The bad news is that from 2008 it has been a disaster. Yet the word ‘productivity’ does not appear in the Budget speech. There are of course small measures here and there that could be filed under ‘improving productivity’, but it is, as Frances Coppola notes, peanuts compared to both the size of the problem and the cuts to public investment undertaken in the first few years of this government. 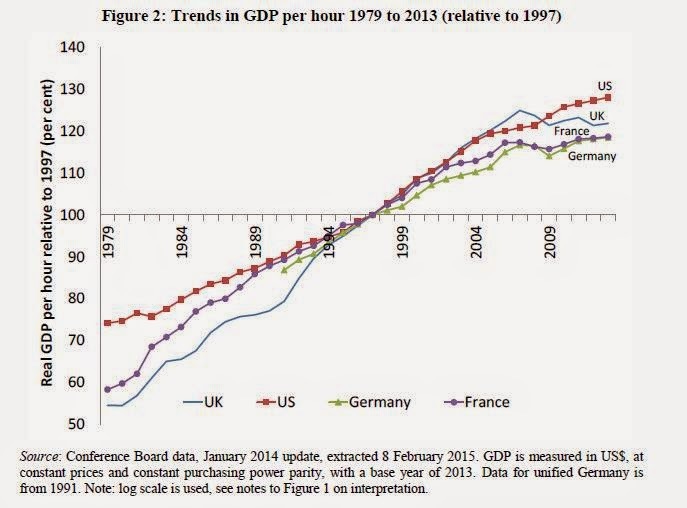 The LSE paper has some interesting things to say about the UK’s productivity gap with other countries (poor investment, low firm and government R&D expenditure, poor management quality), and is fairly critical of the Coalition government’s policies that could influence this. It is fairly easy to make fun of Osborne’s references to his ‘long term plan’, and it is tempting to conclude that the frequent repetition of the phrase means there actually isn’t one. But perhaps it is all very simple. In this piece for The Conversation I suggest that maybe there has been a clear plan all along: to reduce the size of the state over a ten year period, using the deficit as cover. Here is a chart from the OBR’s forecast document showing the projected share of government consumption in GDP. One of the more absurd features of the budget is the kick up in spending pencilled in for the final year, which appeared to be designed only to avoid the Labour jibe that we were going back to the 1930s. Otherwise, the idea is to fundamentally reduce the size of the state, and so far it is going to plan. To finish the job, the Conservatives need to get re-elected, and that required easing up on austerity from 2012 onwards by either cutting taxes or not raising them to achieve the original targets. If this is the real long term plan, then there is no reason to believe that we will not get the promised second period of severe spending cuts once the Conservatives have won the election, with of course tax cuts later on to make it all seem worthwhile. From this perspective, the criticism that Osborne is ignoring the productivity issue may also be unfair. The Conservatives may genuinely believe that the best way of increasing productivity is to reduce the size of the state, and get the ‘government off the backs’ of private enterprise. This theory does not look too good just now, but I guess the lags on this may be long. Alternatively, of course, they may have got completely the wrong idea about the role that government needs to play in encouraging growth generally and innovation in particular. Am I right to assume that these tax giveaways are essentially political? Take the increase in the personal allowance for example. The IFS suggest that aligning the employee national insurance threshold with the income tax personal allowance would be a better policy than raising the income tax threshold, both on distributional grounds (it benefits around 4.6 million low paid workers who pay no income tax), and in terms of work incentives (as it applies only to earned income). On the Help to Buy ISA, see John McDermott in the FT. In passing, it is worth noting that the OBR are also forecasting inflation coming back to 2% - by 2019! This is despite a view that the current output gap is pretty small. Some of the capacity utilisation indicators that go into that estimate do look very strange (tables 3.2 and 3.3). The idea is familiar: New Classical economists do things properly, by founding their analysis in the microeconomics of individual production, savings and investment decisions. It is no surprise therefore that many of today’s exponents of this tradition view their endeavour as a natural extension of the Walrasian General Equilibrium approach associated with Arrow, Debreu and McKenzie. But there is one agent in that tradition that is as far from microfoundations as you can get: the Walrasian auctioneer. It is this auctioneer, and not people, who typically sets prices. Within this framework, the key price when it comes to Keynesian economics is the real interest rate. In Real Business Cycle models it is the real interest rate that moves, by assumption, to ensure that there are no problems of deficient or excess demand. So these models rule out Keynesian features by imagining an intertemporal auctioneer. You might say what is wrong with imagining an auctioneer. Auctioneers are really just an ‘as if’ story that are meant to approximate how markets work. However any story of how the real interest rate gets determined should acknowledge the existence of two critical features of actual economies: the existence of money and central banks. When we allow for the existence of money, it becomes quite clear how the ‘wrong’ real interest rate can lead to a demand deficient outcome. Brad DeLong takes Levine to task for trying to use a barter economy and Say’s Law to refute Keynesian ideas, and Nick Rowe turns the knife. What New Keynesian models do is attempt to remove the intertemporal auctioneer from RBC models. To adapt the Levine quote above, to replace the auctioneer with a more modern macroeconomics - a macroeconomics where firms set prices and central banks change interest rates to achieve a target. Now your basic New Keynesian model contains a huge number of things that remain unrealistic or are just absent. However I have always found it extraordinary that some New Classical economists declare such models as lacking firm microfoundations, when these models at least try to make up for one area where RBC models lack any microfoundations at all, which is price setting. A clear case of the pot calling the kettle black! I have never understood why New Keynesians can be so defensive about their modelling of price setting. Their response every time should be ‘well at least it’s better than assuming an intertemporal auctioneer’. Levine himself makes no explicit reference to New Keynesian models. If he had, he would have to acknowledge that in these models temporary cuts in government spending will indeed reduce output - particularly if monetary policy is unable to respond. All his stuff about perpetual motion machines would have to go out of the window. As to the last sentence in the quote from Levine above, I have talked before about the assertion that Keynesian economics did not work, and the implication that RBC models work better. He does not talk about central banks, or monetary policy. If he had, he would have to explain why most of the people working for them seem to believe that New Keynesian type models are helpful in their job of managing the economy. Perhaps these things are not mentioned because it is so much easier to stay living in the 1980s, in those glorious days (for some) when it appeared as if Keynesian economics had been defeated for good. What criticisms of Calvo contracts and the like should do is indicate the limitations of the microfoundations methodology, but another consequence of the New Classical revolution is that most macroeconomists mistakenly view microfoundations as the only ‘proper’ way to do macro. There is no epistemological basis for this view. As Stephen Williamson points out, these microfoundations would do a pretty poor job at explaining the behaviour of any particular individual, but instead model common tendencies that emerge within large groups of individuals. Are there lessons to learn from this? You can probably divide economists into two camps at this point. One group, the ‘supply group’ - which would include most of those setting monetary policy - tend to think that we have largely done the best we could under the circumstances. By circumstances, I mean two related things: a rather surprising increase in inflation during 2011, and an apparent decline in the ability of the ‘supply side’ of the economy to grow at the kind of rates we might have expected before the crisis. While the former is undeniable, the second is conjecture, because we cannot observe the key driver of long term growth, which is technical progress. The second group of economists attribute more of the slow recovery since the financial crisis to deficiency in aggregate demand. I am in that second ‘demand’ group, and have argued that fiscal austerity is responsible for a great deal of the slow recovery. Implicit in such arguments is the idea that had demand been strong, any further increase in inflation around 2011 would have been modest and temporary, which with wise monetary policy need not have led to any increase in interest rates. I think most of the demand group also share a view that it would be a large mistake to shrug off this bad experience as a one-off, or as something that only occurs every century or so. The ‘one-off’ story could focus on an unfortunate misreading of the Eurozone crisis: however, while this might explain the change in attitudes is some important institutions like the IMF, it is less plausible in explaining why policy makers around the world switched to austerity. The ‘every century’ idea is wrong because it fails to note the changes that have been brought about by the widespread adoption of 2% inflation targets, coupled with a view that the ‘natural’ real interest rate is also likely to remain low for some time. Different members of the demand group have proposed three different and radical innovations in macroeconomic policy to help avoid this kind of mistake happening again. These are targeting the level of nominal GDP (NGDP), raising the inflation target, and some form of helicopter money. Are these innovations alternatives or complementary to each other? There are some (notably market monetarists) who seem to argue that changing monetary policy to NGDP targets is sufficient. My own view is less optimistic. A clear advantage of NGDP targets (and not its only advantage) is that they would create expectations of a more expansionary policy during and after the recovery phase from a recession, but in my view this would not be enough to prevent liquidity traps happening. This is because I see the problem of the liquidity trap (nominal interest rates being unable to fall below some lower bound around zero) as central to why the Great Recession was so prolonged, and episodes where we experience a liquidity trap as becoming more frequent because the inflation target (explicit, or implicit within the NGDP target) is low. Raising the inflation target is an obvious way of reducing the frequency of liquidity traps. If the natural real interest rate is 2%, for example, then with a 4% inflation target, the nominal interest rate has much further to fall before the lower bound is reached than if the inflation target was 2%. It is important to note that this argument does not preclude adopting a NGDP target, because any target path for NGDP includes an implicit inflation target. For that reason, you can view NGDP targets and a higher inflation target as either complementary or alternatives, where the latter is true only if you think one device does the required job by itself. Helicopter money is essentially giving the central bank an additional instrument - a form of fiscal stimulus. In that sense it is rather different from NGDP targets or a higher inflation target, because it involves instruments rather than the objectives of monetary policy. For that reason, in principle it could be a complement to both the other radical suggestions. In a way helicopter money is best seen as an alternative to Quantitative Easing, and there is no reason in principle why QE is not compatible with NGDP targets or a higher inflation target. It is possible of course that if helicopter money was shown to be effective in dealing with liquidity traps, then it would make the case for other radical changes less compelling. If I’m being realistic, I think that if the first sentence of this post turns out to be true, the chances of any of these radical changes being adopted before the next liquidity trap episode are very small. A period of strong growth will be sufficient for policy makers to pretend that the slow recovery from the financial crisis was either a one-off or the best that could be done in the circumstances. Instead I suspect that as the economy moves ever closer to its pre-crisis trend, the demand group of economists will convince more of the supply group that they were wrong. This will give greater credibility to the idea that radical changes to policy are required, and each alternative will receive greater analysis and probably greater support amongst economists by the time the next liquidity trap episode occurs. You might imagine that the global financial crisis had reduced the power and influence of finance and those involved in financial markets. After all, the excesses shown by participants in those markets had caused the largest recession since WWII. (Not to mention a constant stream of cases of illegality and mis-selling.) However I wondered yesterday if the opposite might be true. This was during a debate at the Houses of Parliament, in which Jonathan Portes and I were debating austerity with Roger Bootle and Doug McWilliams. A constant refrain from our opponents was that (a) the stock of government debt was very large, (b) you needed the confidence of markets to be able to maintain this level of debt, (c) markets were fragile beasts, so best take no chances, and (d) therefore we needed austerity to reassure those markets. I immediately thought of one of my better posts, where I suggest too many people view markets like a vengeful god, and those that are ‘close to the markets’ like high priests. (I couldn’t quite believe it when a member of the audience asked our opponents about whether they thought some proposal would ‘pass muster with the markets’.) Now Roger, who is a sensible guy, did agree that default was not really an issue for the UK, but the danger was rather inflation, if the deficit or debt became ‘too large’ and markets refused to fund it, so it had to be monetised. If it seems odd to you that the markets would start worrying about the monetisation of debt because a large recession increased deficits, but be quite unconcerned today about the central bank creating money to buy huge quantities of government debt as part of Quantitative Easing, then your mistake is to think that the markets are always rational. If they are both fragile and febrile, as our opponents and others close to the markets often suggest, it could happen. Before the financial crisis, it was in the interests of those involved with financial markets to emphasise how rational they were. No need for regulation - these are clever people who knew what they are doing. The crisis blew that argument apart, but instead it created the idea that the markets could be dangerously irrational: irrationally exuberant at one point, and irrationally risk averse the next. It also showed how dependent on these markets the economy had become. Hence the idea of a vengeful god that could suddenly turn on you for no good reason and who therefore had to be appeased at every turn. This kind of argument has a strong emotional appeal, particularly when the financial crisis is fresh in peoples’ minds. I suspect that attempts to show that markets are actually pretty rational most of the time will not work. Instead I’m afraid we have to focus on the high priests. A truly irrational market could do anything. The problem comes when the high priests declare that, by being close to the markets, they can discern some logic to its tantrums. And by a divine coincidence, this logic just happens to fit macro view of the world that the high priests hold. For example, we are told that markets worry about large deficits and require austerity immediately. Never mind that there is no sign of worry, and that interest rates are falling: markets are fragile and febrile and could turn at any moment. The high priests, being close to the markets, understand that. Strangely the high priests never detect any concern that a persistent recession brought about by austerity might - through hysteresis effects - permanently damage productive potential, with potentially greater impacts on the tax base and long term solvency. I guess the high priests markets had not read that paper. We are told that Osborne needed to give a clear demonstration to the markets that he had the political will to bring the deficit under control, which is why deficit reduction had to be front loaded. It does not seemed to have occurred to the high priests markets that, given his desire to reduce the size of the state and win the next election, front loading austerity is exactly what he wanted to do, even if he had no particular concern about the deficit. To show a clear conviction to give top priority to reducing the deficit required him to do something that was politically costly, like raising inheritance tax. And do not forget that Ireland and Portugal were constantly told by those close to the markets that they needed to embark on acute austerity to ‘regain the trust of the markets’, when in fact what the markets were looking for all the time was for the ECB to act as a lender of last resort. I could see that from my academic ivory tower, but most of those ‘close to the markets’ did not. The financial crisis may have told us about the power that financial markets have, and how it is important to understand how they behave. But the way to do that and to make good policy in the meanwhile is through economic science, and not to rely on the wisdom of priests. As I said in my little speech at the debate, the cost of UK austerity in 2010 and 2011 was at least 5% and probably more like 10% of GDP, numbers which neither of our opponents challenged. The gods it seems require big sacrifices nowadays. But if the only reason for making this sacrifice is that the high priests tell us that this is what the gods require, then I think the time for enlightenment is well overdue.